Protects XR5 Data Logger in outdoor or hostile environments. Pace EC Series enclosures withstand all weather conditions. Each has a hinged cover, continuous neoprene o-ring seal and one or two quick release latches. Feed-through cable fittings accept cable diameters up to 0.25" (6.3 mm). EC24 Low Profile Case: Two (2) cable fittings, available in Yellow or Black. 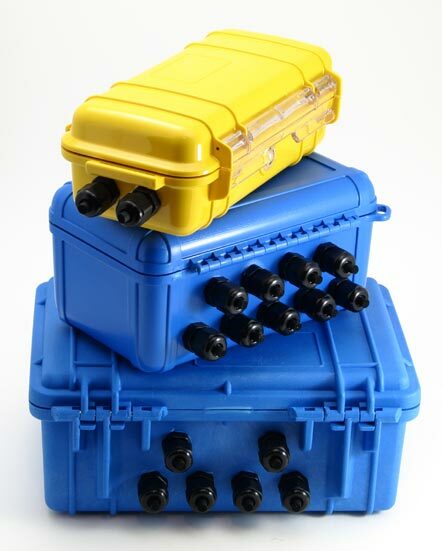 EC45 Compact Case: Nine (9) cable fittings. EC55 Heavy Duty Case: Six (6) cable fittings, folding carrying handle, padlock ears, heavy duty construction. About twice the weight and volume of the EC45. © 1996-2015 Pace Scientific Inc. All rights reserved.